These are words Bradshaw uses to describe how he felt when he learned that he would be receiving a kidney donation after just one year on the organ donation list. It wasn’t just the timing that surprised Bradshaw, but he learned that his donation would be coming from his friend and fellow pastor, Bro. Mike Woodrum. “When I got the call from the doctors in Louisville and found out my donor was Bro. Woodrum, I just gave all the praise to the Lord because He is the one who made this all happen,” says Bradshaw. Bradshaw says that he had many friends and family members apply to be his donor but a match had not been found over the past year. Bradshaw has dealt with kidney disease for the majority of his life but over the past year or so, his symptoms progressed. Bradshaw was surprised to learn that Woodrum went through the whole application process. Woodrum says he believes it’s important to help a brother or sister in need and that it is the right thing to do. Woodrum knew that kidney disease ran in Mark’s family and he just wants Mark to be able to live a good quality of life. Bradshaw will receive Woodrum’s kidney on Tuesday after the two undergo multi-hour surgical procedures with several weeks of recovery to follow; Bradshaw will have to return for a follow up surgery in six months to remove his other affected kidney. 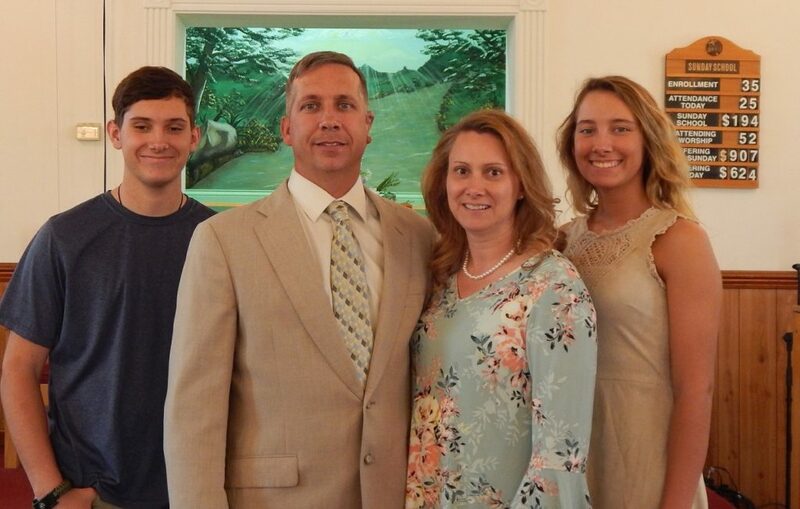 Sunday, a special prayer service will be held at Kellyville Community Church for Bradshaw and Woodrum and everyone is invited to attend to help pray for a safe and successful surgery and recovery. Blake, Mike, Marsha, and Kelsey Woodrum. Mike says he is very blessed to have his son, daughter, and wife in his life. Mike is donating a kidney to his friend Mark Bradshaw on Tuesday.